Saturday, Dec. 5, 2015, Shamong’s Home and School Association conducted its eighth annual all day indoor soccer tournament to raise funds to offset the costs for the annual sixth grade Camp Ockanickon ecology camping trip, scheduled for late May, 2016. This year, as always, it was organized by Mr. Tim Carroll and supported by the school’s soccer team and a small army of parents and alumni students. 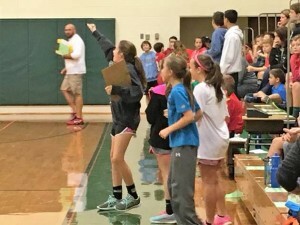 A total of 27 middle school students, nine parents, nine high school students from Seneca, and one college student joined Carroll to run concession stands, coach teams, and referee the games throughout the day. Additionally, 21 families chipped in to donate food to keep the energy levels up and the fans in the stands. From 9 a.m. until 5:30 p.m., 179 students from grades one through eight tussled on the gym floor for the chance to take home the title of grade level champion. What better way to fight off the chill of a cold December day! In the end, almost $2,400 was raised and everyone involved walked away with a sense of community and a smile that you get from doing something that can only be described as pure fun.